I started playing with Symfony2 when it was in beta. The biggest obstacle in my learning process was the lack of an architectural overview; something that would describe the flow of execution of every request, at least at a very coarse grain. I tried to read the official docs and various articles on the Net: I was able to do things but didn’t know how (and why) they worked – when they did. The immediate consequence was that I was almost always unable to adapt the examples to my specific needs. Then I read Fabien Potencier’s series “Create your own framework… on top of the Symfony2 Components” and began to understand. Symfony2 architecture is based on two key subsystems: Dependency Injection Container (DIC) and Event Dispatcher. Knowing these two, everything else was easy to learn for me. I’ll share this knowledge, hoping it will help someone else to learn Symfony2. 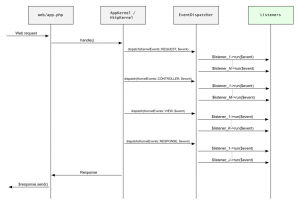 Every web request (larger picture) is processed by web/app.php. It initializes the autoloader and instantiates an AppKernel that will process the request. A Request object is created from globals ($_GET, $_POST, etc) and passed to the AppKernel via the handle() method. AppKernel, in turn, calls the handle() method in HttpKernel and the real processing begins. The handle() method creates an Event object containing the original Request object and some other bits. 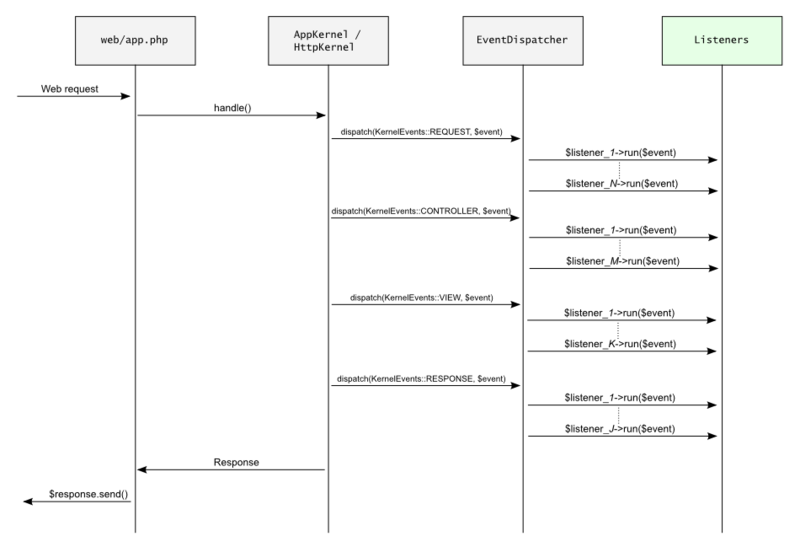 It then calls the dispatch() method of the EventDispatcher, passing the Event and a constant (KernelEvents::REQUEST) to specify the event type. The EventDispatcher has a list of listeners that are called in sequence passing the Event to each of them. The EventDispatcher knows which listeners to call, because each listener registers itself in the EventDispatcher, indicating the event type they are interested in. The net result is that the original request get processed by a series of listeners that can modify the request object. The same procedure is then repeated for KernelEvents::CONTROLLER events, KernelEvents::VIEW events and KernelEvents::RESPONSE events. In the last round, the Event carries a Response object that is returned back to web/app.php. The Request object is then sent to the net via its send() method. The actual flow in HttpKernel::handle() is a bit more complicated, but the basic idea doesn’t change. The first round of listeners act on an Event containing the Request object. For example, routing is done in this phase. A RouterListener parses the request and adds specific fields to indicate the selected route and any additional route parameters. This information is used by a ControllerResolver to determine the correct Controller and action to call. Also the Firewall is called in this round to check if access control should be enforced. The other architectural cornerstone in Symfony2 is the Dependency Injection Container, DIC for brevity. Complete documentation for the DIC is at the Symfony website. Basically, the DIC is a recipe book for constructing objects and maintaining a reference to them. Every time you ask for a service (an object), the DIC creates the object using your recipes and returns it. If it was already created, it returns a reference to the existing object. Why should you use it? There are a few presentations on Slideshare from Fabien, with a thorough discussion. It gives you the consistency of a registry, without resorting to globals, singletons and other tricks that render your code untestable. It is so simple and powerful that the entire framework is built using the DIC. Your request enters the kernel and is passed to various listeners. If you don’t need special processing, you can generate a response in the controller; it is called from the HttpKernel::handle() method after the KernelEvents::CONTROLLER event. If you need special processing before the controller is called (custom authentication, logging, etc. ), you can add a listener to the KernelEvents::REQUEST event, and perform your processing inside the listener. The listener can be easily added using the DIC, and it can access all services managed by the DIC: logger, Doctrine, router, mailer, HttpKernel, etc. If you need special processing after the controller is called (filtering, logging, compression, etc. ), you can add a listener to the KernelEvents::RESPONSE event, and perform your custom processing inside the listener. This guide is work in progress. Any suggestion, criticism, fixes and contribution are highly appreciated.